A front-impact car accident, often referred to as a head-on collision, occurs when the front-ends of two vehicles collide into each other. Although head-on collisions are not as frequent as a rear-impact or side impact collision, the front-impact collision often involves fatalities. In 2005, it was estimated in the United States that head-on crashes only accounted for roughly 2 percent of all car collisions but for 10 percent of all fatalities. 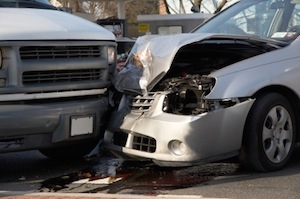 The mechanism for head-on collisions usually involves a road departure or lane-departure crash. Typically, a motorist will fail to stay within their own lane and cross the centerline over into opposing traffic. Sometimes, a motorist will enter the wrong way on a roadway and collide head on into on-coming traffic. The force of a frontal impact is great. According to Newton’s Third Law of motion, to every action there is always opposed an equal reaction. The popular television show, “Mythbusters,” conducted a front impact collision between two cars. The myth was that the force of frontal impact between two vehicles that were both traveling 50 MPH would be equivalent to one car hitting a solid wall at 100 MPH. After research and testing was conducted, the myth was broken. It was proved that the mutual action of two vehicles colliding into the front of each other at the same speed of 50 MPH was the equivalent of 50 MPH of force. Of course, this is an affirmation of Newton’s Third Law. The most common type of injuries in a head-on collision includes broken bones and joint and muscle injuries. Due to the mechanics of the body moving rapidly upon impact, the lower extremities including hip, knees, leg, ankles and feet are subject to injury as they absorb the full force of the crash. As part of this movement, the feet and ankles can be caught under the dashboard, steering wheel or gas pedal, which causes traumatic rotation or twisting of the knees. It is not uncommon for victims to sustain ligament damage in the knee such as a MCL (medial collateral ligament) or ACL (anterior cruciate ligament) tear. Additionally, one may experience injuries to the lower or upper part of the leg, hip or shin. Due to potential catastrophic injuries involved in a front impact collision, it is important to seek legal advice from a car accident attorney to determine your options under the law. The Law Offices of Kevin C. Ford has been handling head-on collision crashes and other vehicle collisions for nearly 20 years. To quickly determine your rights under the law, please contact an experienced personal injury attorney.